Each bespoke corset is as unique as you! Each of our corsets is entirely custom made to measure from the pattern, through to construction and finishing. Everything is hand made in the Starkers Studio in Toronto, Canada. I create each bespoke corset with high quality materials, English corsetry coutil, and German steel busks and bones, and techniques I have developed from over 25 years of experience making corsets, so with proper care, your bespoke corset is built to last. How Does Starkers Corsetry Create A Bespoke Corset? When we create a bespoke corset for you, I work directly with you in the design process, where we collaborate on designs and details that you want featured in your corset, so your imagination is the limit! In Toronto, I carefully measure you for your pattern, or I will instruct you on how to take your measurements yourself. Don’t worry if you’re a novice, I always check them for accuracy. There are 15-35 measurements that go into each corset, depending on style and symmetry. I draft your unique pattern from scratch using each of your measurements, never by re-sizing premade patterns. Each person has a unique bone structure, and a custom drafted pattern is the best way to capture the subtleties of each persons frame. Your corset fabrics are cut and constructed, and stitched to an inner layer of English coutil, which helps your corset keep its shape, along with the twill waist tape, and lined in a soft cotton lining. The German steel busk is properly reinforced, with an underbusk flap and two ply grommets for the satin ribbon lacing to slide through. Monogrammed Modesty Panels For A Personalized Touch! Our bespoke corsets now come with a custom monogrammed modesty panel! 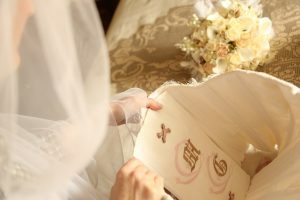 Have your initials, a special date, or a signature saying hidden on the inside of your corset for only you to see. If you are in Toronto, we book at least one in-person fitting with me to be sure the fit and look is perfect. If you are outside of Toronto, United States, or Europe we mail you a mock up with your fabric swatches. Your purchase includes as many fittings and alterations that may be needed. Your custom corset will be ready within three months of placing your order. If you require it sooner, I do have rush services available to suit your time frame. Shop in Canadian or American currency! Each Starkers! Corset is as unique as the person it is made for. Each corset is entirely custom made to measure from the pattern, through to construction and finishing. Everything is hand made by me in the Starkers! Studio in Toronto, Canada. Each corset is made with high quality materials, English coutil, and German steel busks and bones, and techniques I have developed from over 25 years of experience making corsets. With proper care, your corset is made to last.